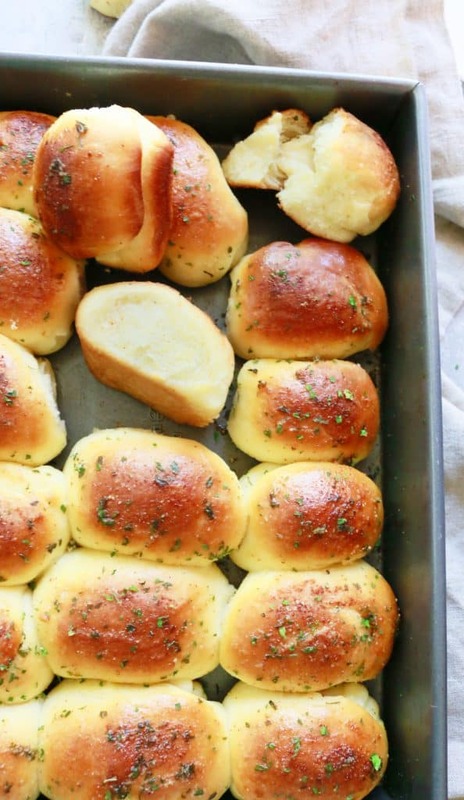 Pillowy soft, buttery, cheesy, garlicky parker house rolls! Ultra soft with garlic butter coated in many (3 to be exact) stages and stuffed with cheese. 1. 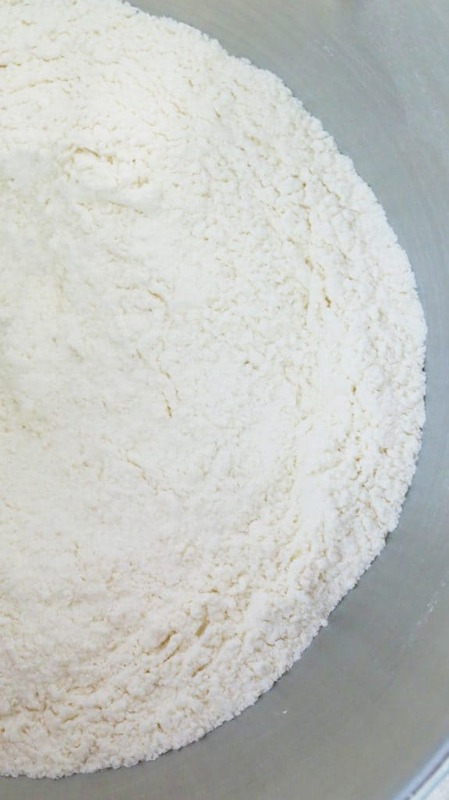 In the bowl of your stand mixer, combine flour, sugar, yeast and salt. Whisk well. 2. Add milk, 4 tablespoons butter and beaten egg. 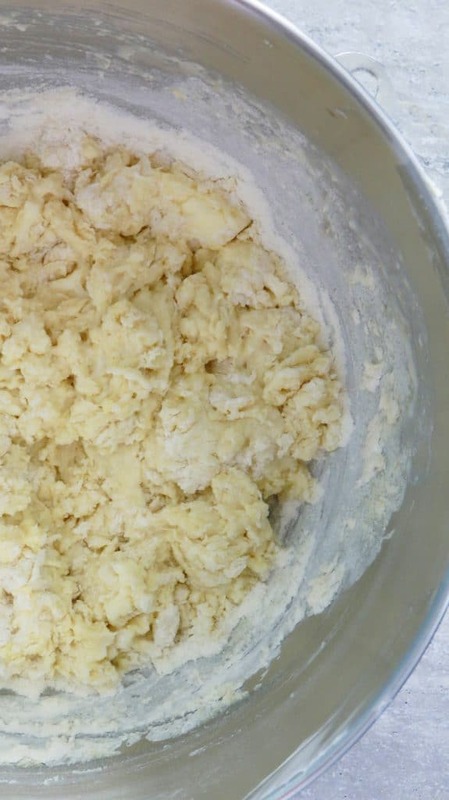 Stir mixture with a butter knife or a spoon, until flour is moistened. 3. Attach bowl to the stand mixer along with the dough hook, beat on high for 3 1/2 minutes. 4. Transfer dough onto a work surface and shape into a ball. 5. Into the now empty bowl, spray a coating of non-stick cooking spray. 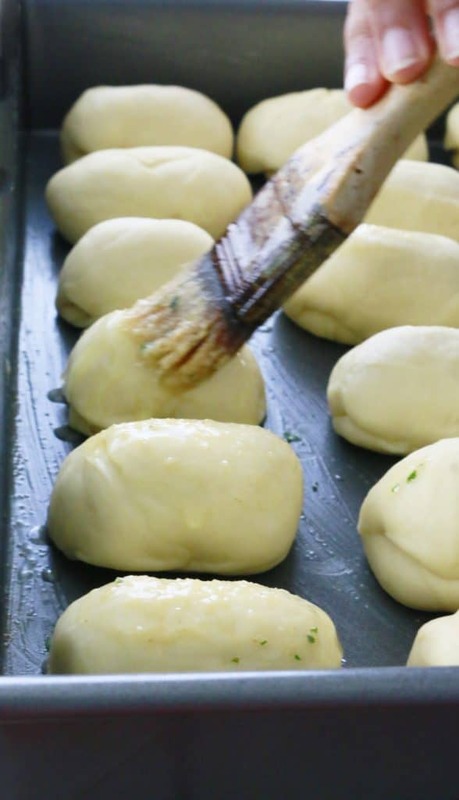 Place dough ball and toss it around for the oil to coat all sides. Cover bowl tightly with a clean kitchen towel or plastic wrap and let rise in a warm place for one hour. 6. In the mean time, place remaining 4 tablespoons butter in a small microwavable bowl and microwave until melted. Stir in garlic powder, dry parsley and salt. (We will use this garlic butter at various stages). 7. Brush the bottom and sides a 9 x 13 inch baking pan with a light coating of the garlic butter and set aside. 8. 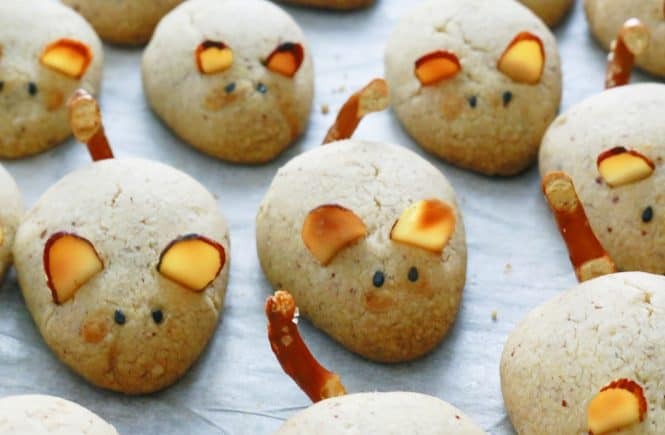 After the dough has risen for an hour, transfer dough onto a work surface, cute into 18 equal pieces (cut dough into thirds and each third into 6 pieces). 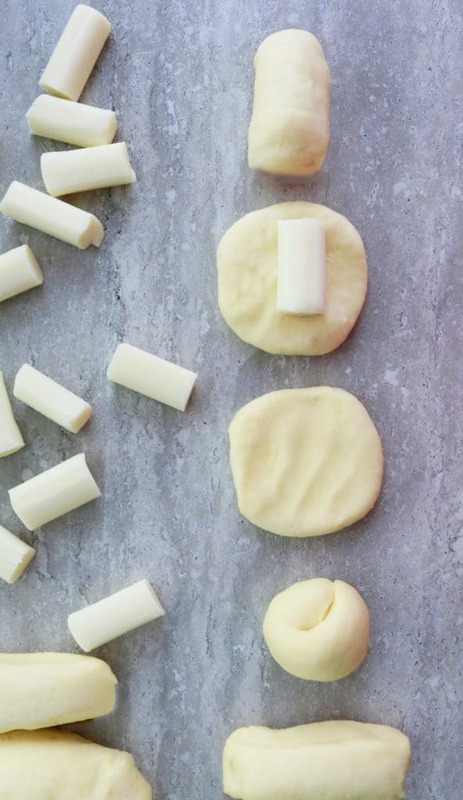 Gently roll each piece into a loose ball, pat into 3-inch disc, place one piece of string cheese, fold the dough over to enclose the cheese, press the edges with your fingertips to seal. Repeat with remaining dough and cheese. 9. 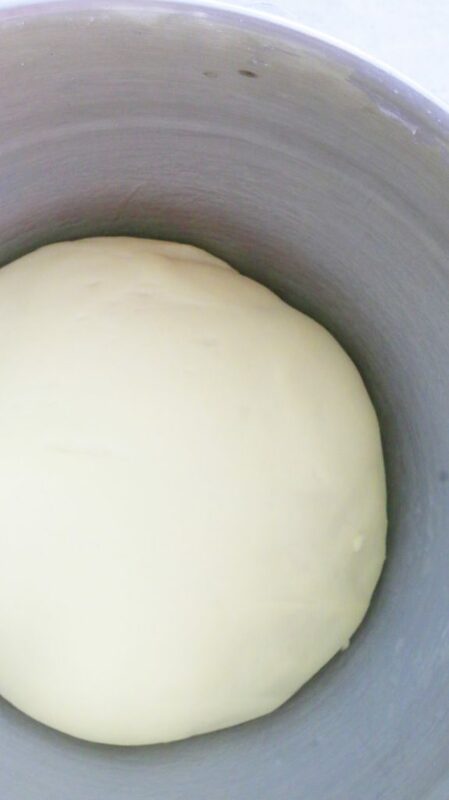 Place dough in the prepared pan, spacing evenly. Brush the tops lightly with a coating of garlic butter (if butter has thickened, then microwave for a few seconds to melt ). Wrap pan tightly with a clean kitchen towel or plastic wrap and let rise in a warm place for 30 minutes. 11. Brush the roll tops again with a coating of garlic butter (if butter has thickened, then microwave for a few seconds to melt). 12. Place pan in the middle rack of the oven and bake for 25-30 minutes or until tops are deep golden. 13. 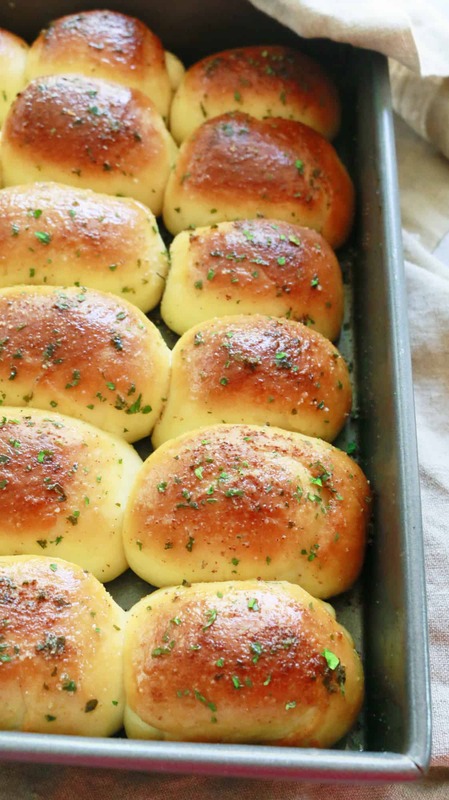 Remove pan from oven, place on a wire rack and immediately brush the roll again with a coating of garlic butter (if butter has thickened, then microwave for a few seconds to melt ). It is absolutely important for egg and butter to be at room temperature. Luke warm milk is 105F – 115F. An easy way to check without a thermometer- sprinkle few drops of milk on the inside of your wrist. It should neither feel hot nor cold. Use whole or low fat milk. 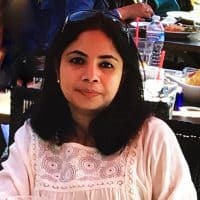 Please avoid fat free. Leftover rolls can be placed in a freezer safe zip lock bag, sealed tight and frozen for several weeks. Thaw and microwave until hot, enjoy. Since the garlic butter is used over a period 2-3 hours, butter tends to solidify. So, pop the bowl in the microwave for a few seconds to liquify before using it each time. These are amazing!! I’d be terrified that I would eat the whole pan as soon as they come out of the oven. 3 stages of garlic butter – you’re a genius. Have a great weekend!! 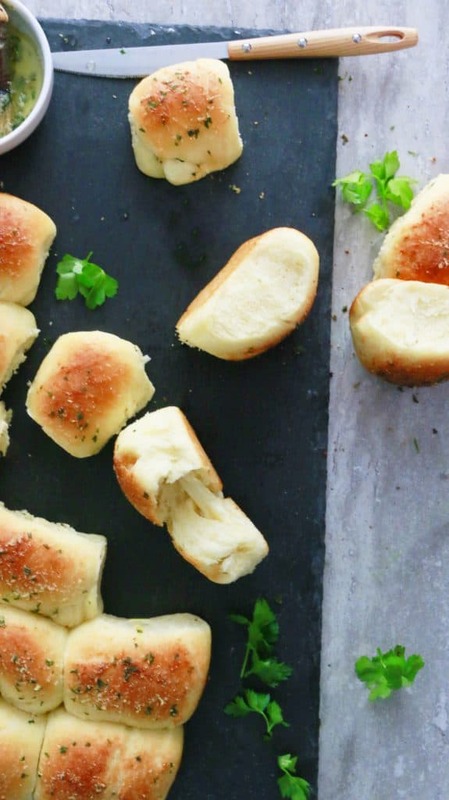 Buttery and garlic-y and pretty much everything I want in life. Yes, please to these!! 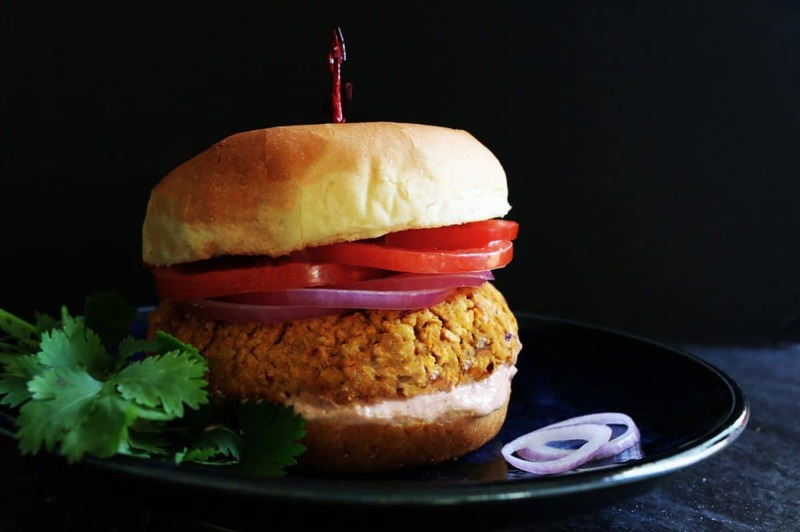 You had me at buttery and kept me with the rest :). 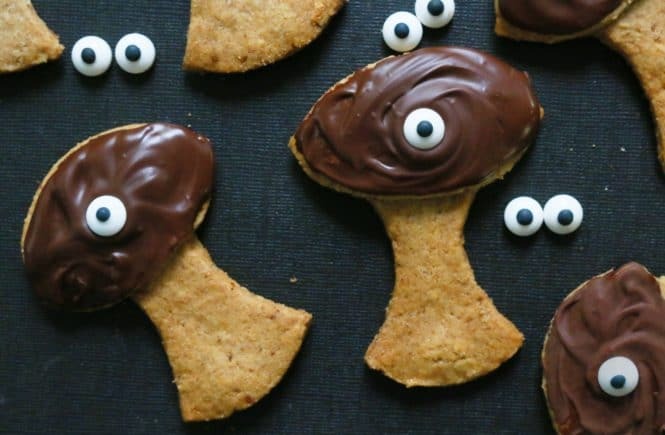 These look AMAZING, Maria! I love homemade rolls and bread, it sends such a delicious aroma around the home. These are happening!! I can’t wait! 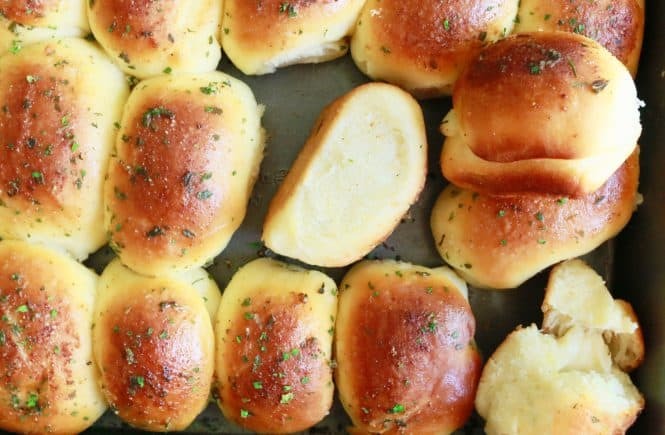 garlic butter 😍😍 and as a lover of string cheese, i love that you baked some into these! i normally just pull them into a million strings lol. 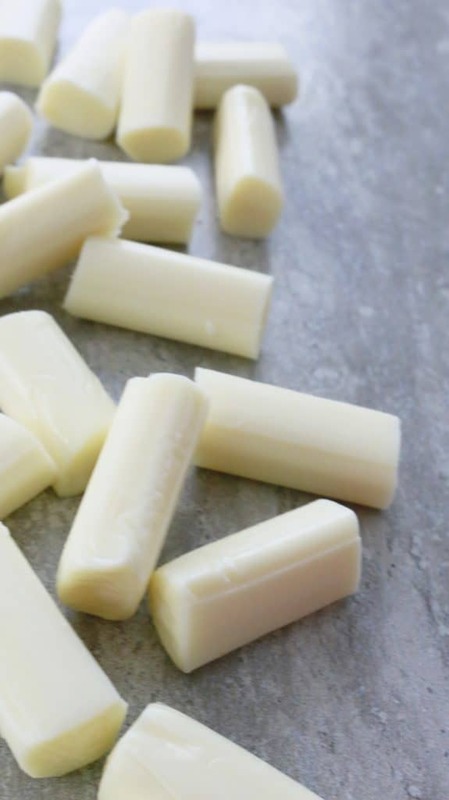 (speaking of which, i feel like string cheese tastes completely different when bitten vs stringed apart).